Put pumpkin, nutmeg, prosciutto, chicken mince, spinach, garlic and ricotta into a bowl and mix well to combine, set aside. Heat the oil in large, heavy based frypan (use high sided saucepan to stop splatter). Add garlic and onion and cook over medium heat until soft and golden. Add the tomato passata and white wine and bring to the boil. Cook over high heat for 5 minutes or until sauce thickens. Remove from heat, stir in basil and season to taste. Set aside. Preheat oven 180c. Spoon some of the tomato sauce over the base of a large oven proof dish. Arrange lasagne sheets over the top. 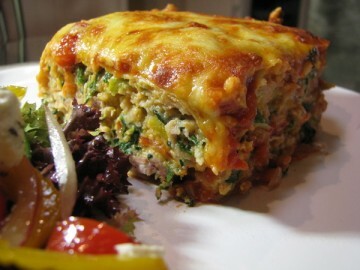 Top with half of chicken mixture, then another layer of lasagne. Spoon more sauce on top, lasagne, then remaining chicken mixture on top, lasagne, then final lot of sauce. Sprinkle with combined cheeses and bake for 25 minutes or until pasta is soft and cheese is golden. If your top is not golden but your lasagne is cooked, brown under grill.